Any well-drained soil. Low fertility not a problem. Back of border. Excellent cut or dried. Undemanding and long lived. Division every 3 to 5 years is beneficial. This plant makes an attractive and unusual back of the border plant. Yes, it is a thistle but its silvery foliage and metallic blue flowers are good accents against other plants. It is a stately plant reaching 3 to 4 feet in height. Give it an area of at least 2 to 3 feet in diameter. 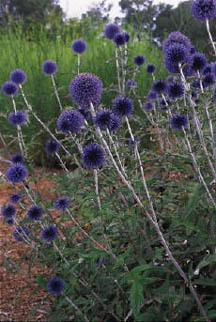 Echinops will do well in almost any soil as long as it is not waterlogged. It is quite drought tolerant. Plants can be divided in the spring. The roots are mammoth and woody - division will require some effort and tools. The plants will appear stressed after division but usually pull through quite well. The flowers are prized by arrangers who use them both fresh and dried. For those who grow flowers for drying and have ample space, a combination of globe thistle and yellow yarrow is very attractive in the back of a sunny border.